I mentioned the other day that I would be posting my next class soon. I've decided that due to time constraints, I will not be doing this as a class but selling it as a tutorial instead. I have too much on my plate right now and something had to give. I am putting the finishing touches on the tutorial right now, but I wanted to post some pictures of the project so you can see what I'm working on. to reveal the message. Fully opened, the "book" measures over 12" wide. The message is written on tabs that are angled in different directions. Here's a better look from the side. You can click on any of the photos for a larger view. You can customize the message, colors, and front of the book for any occasion. Be on the lookout for the tutorial coming soon. Thanks for stopping by! UPDATE: The tutorial is now finished. Click here to find it. Today I've been working hard on a few different stamping projects. I have some stamping deadlines that I'm trying to meet so I'm pushing myself to get as much done as I can. I did, however, want to stop in quickly and show you one of the projects I'm working on. It's a gift card holder that can hold 2 or 3 gift cards. I know you want directions, but I don't have time to post the tutorial today. I'll have it up in the next couple of days though. Be sure to stop back by so you don't miss it. Thanks for stopping by! UPDATE: Click here to view the tutorial for this project. Today I started digging through my stash of stuff I bought at the store to alter and I found a bunch of thing that I don't even remember buying. How bad is that? I have so much stuff stashed away and I need to pull it out and start using it! I thought I'd start with these cute post-it notes. The flowers made me think of the Build a Blossom stamp set and the coordinating Blossom Petals punch so that's what I used. I made a cover for the post-it notes and now I can give it away as a gift. Click here to see some tips on how I put the flower together. I debated adding some polka dots to the yellow layer with an embossing folder, but I decided to sew the layers together instead. This was a very quick project to put together. This weekend I've had lots of fun stamping. I'm working on my next stamping class and I'm hoping to have all of the information on that posted on my blog later this week. I think you're really going to like it. I've also been working on some stamping projects for some ladies who live here in town. One of the projects that was requested was a thank you card. I tried to make something that was simple, duplicatable, and flat so it wouldn't cost extra to mail. Here's what I came up with. The Four Frames stamp set and the Paisley Petals designer series paper are going to be in the next Stampin' Up! catalog. However, you don't have to wait--you can get both items now! 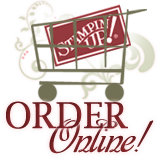 You can purchase both items with a $20 Stampin' Up! purchase or you can get them free for hosting a $350 workshop. Click here to read the flyer and to see more details. You can also click here to place your online order. I kept the same basic layout for the inside of the card minus the polka dots. That could be fun trying to fill out a card that's bumpy! Thanks so much for stopping by! Do you ever go blog surfing and see something so cute that you just have to make it? That's how I came up with today's project. That bunny is absolutely adorable. You can click here to find the tutorial on how to make him. The box was made from the Fancy Favor Big Shot die. Instead of folding it on all of the score lines on the sides, I only folded the box on the four corners and covered the score lines with some DSP. The handle is 3/4" wide with a 1/2" piece of DSP down the middle. I added a brad at the ends of the handle to help hold it in place, and then covered the brads with ribbon bows. I filled the box with some Easter candy and now it's ready to give as a gift. Here's a closer look at the bunny. I punched most of the pieces out of Crumb Cake cardstock and sponged the edges with Soft Suede ink. The Pink Pirouette cardstock is sponged with Pretty in Pink ink. I used Soft Suede and Basic Black markers to add in the little details. I don't have the bird punch that she used to make the eyes, so I use the Owl punch for both of the eye pieces and for the nose. Today when I sat down to stamp I decided to combine two challenges. I tried the Faux Fabric technique and this week's Viva la Verve sketch challenge. I figured since it was faux fabric, I might as well break out my sewing machine too. I don't sew often on my cards, but I love the finished look it adds. I ran a piece of Old Olive ribbon across the center and then tied off the two ends with a piece of Hemp Twine. I also added some green dew drops which appear more blue in this photo. I stamped the flower and leaf images on Whisper White cardstock, cut it out with my Nestabilties, sponged the edges with Not Quite Navy ink, ran it through the Big Shot using the Square Lattice Embossing Folder, and then distressed the edges. It definitely gives a cotton/fabric look to the cardstock. I finished off the inside of my card with some more sewing and a few more layers. Thanks so much for stopping by! Last year at one of my downline meetings, Donna brought this adorable Easter Bunny box for us to make. I got most of the parts sponged and the little pieces glued on, but I didn't finish it until now. Isn't she cute? I don't know where Donna got the original instructions, all I know is that it was created by Terri Ransom. You can click on the photos to see a larger view. All of the Whisper White cardstock (except for the whiskers and the box) were sponged with Going Grey ink. All of the Pretty in Pink cardstock was sponged with Pretty in Pink ink. I used a Basic Black Marker to add the little dots on her cheeks and to draw in her mouth. I also added a few highlights with a White Gel Pen. Here's a list of all of the punches and dies that were used. The whiskers are thin scraps of cardstock held in place with a glue dot. My daughter thinks I should have used a cotton ball or something with more dimension for the tail, but I was trying to stick with the Stampin' Up! punches and dies. The box is a piece of 8 1/2" x 4 1/2" cardstock. With the 8 1/2" side going across the top, score at 3 1/2" and 5". With the 4 1/2" side going across the top, score it at 1" and 3 1/2". Cut on the four small score lines and use Sticky Strip to form it into a box. Add sticky strip to the front and back of the box and adhere it to the Top Note Die bunny pieces. Fill the bunny with chocolate and you have a cute gift to give away this Easter/spring. I think I covered all of the directions, but if I left anything out or you have any questions please don't hesitate to ask. Thanks for stopping by! I'm still here! Sorry for the long break in posting. I was knee deep in taxes, kids with pink eye and life in general. I'm caught up on life and it feels wonderful getting back to stamping again. I decided to start with this wonderful Mojo Monday sketch from last week. The sentiment says, "Victory is always possible for the person who refuses to stop fighting. -Hill" It comes from Verve's "Believe" stamp set that was designed specifically for Breast Cancer. I made this card for my mother who is a breast cancer survivor. She was diagnosed five years ago this month. I'm so grateful that she has survived and that she's been cancer free for almost five years now. I was going to add more to the card so that it looked just like the sketch challenge, but I didn't want to take away from the beautiful sentiment. I used this tutorial on SplitCoast for the ribbon around the sentiment. The inside of the card has pretty much the same layout as the front. It has plenty of room for me to let my mom know how much I love her and how much she inspired me as she battled her cancer. Thanks for stopping by!